Listed in: Benchers, Books, Candlesticks, Gifts, Ketubah, Kittel, Silver, Tallis and Yarmulkes categories. 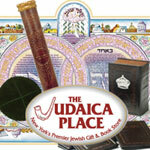 Judaica Place is NY`S premier Jewish gift and book store. We are located in the heart of Brooklyn,NY in the Flatbush section. We have over 20 years of combined experience and boast the largest collection of in stock judaica items. Get more for your wedding! Don't forget to mention ChossonKallah.com when visiting Judaica Place. Nicest people in the world!